Whitney Jennings dribbles the ball up the court during a game last season. Jennings led the team with 539 points last season. Jimmy Lafakis/Collegian file photo. Last season, the Butler women’s basketball team finished 15-17 overall and 6-12 in conference. After winning 11 of their first 16 games, the Bulldogs were vying for tournament success. Losing 12 of their last 16 dashed any hope of doing so. But then they toppled Providence 73-76 in overtime in the first round of the Big East Tournament. The Bulldogs eventually lost to Marquette, but not before experiencing enough success to crave more this season. “We have to put ourselves in a position to win and then finish it,” head coach Kurt Godlevske said. It’s the team’s new motto. 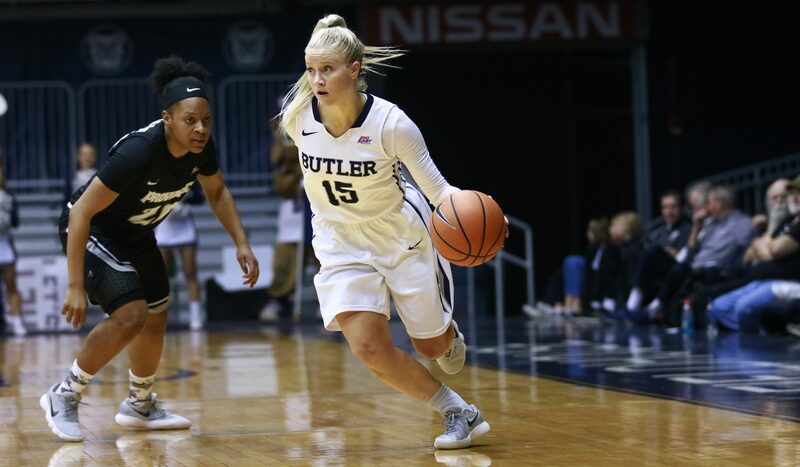 To finish what they started, Butler’s captains Whitney Jennings, Michelle Weaver and Tori Schickel need to keep performing at a high level. The team will also need to replace the production and leadership of Iman Lathan and Sydney Buck, who graduated after last season. Lathan started 29 of the team’s 32 games and averaged 5.1 points per game while Buck was a two-year team captain. Schickel was one of the most consistent players last season, scoring in double figures 29 of 32 games. She said she wants her on-court consistency to be noticed by the younger players. Jennings led the team in scoring and assists after transferring from Iowa the year before. She scored 539 points last season, fourth-highest in program history, and knocked down 80 3-point field goals, good for third in program history. “I think it’s taking more on more of a leadership role and knowing that a lot of the underclassmen players are going to look at you to lead them and guide them,” Jennings said. Last offseason, Kristen Spolyar was recovering from an ACL injury. The setbacks resulted in her starting only nine of 31 games, but she still logged the fifth most minutes on the team. Godlevske has implemented drastic offensive and defensive philosophical changes in hopes of competing for a Big East title this coming season. Offensively, Godlevske aims to speed up the pace — pushing the ball in transition and filling the lanes — which brings its fair share of upsides. Speeding up the tempo has its downsides, too. Risk-taking in transition can lead to errant turnovers. Slower teams, on the flip side, are inherently more patient. Last season, even with a slower pace, Butler was fourth in turnovers with 15.9 per game, less than only Xavier, Seton Hall and Providence. Upsides and downsides considered, dispersion of the scoring load is equally as important because the 10 Big East teams meet twice a year and can pick up on tendencies and play calls. Jennings and Schickel combined to score or assist on about 42 percent of points last season. In short, a deeper rotation enables a variety of looks on both ends. This season, three transfers are eligible to play — Naira Caceres (Maine), Katherine Strong (Virginia Commonwealth University) and Ashanti Thomas (Penn State University). Last season, only six Butler players averaged upwards of 12 minutes, allowing 17.6 points in the fourth quarter, the most of any quarter, as a result. Thomas, a former top-100 recruit from Penn State, is a physical post-player on both ends with a knack for rebounding, and averaged 3.7 points and 3.1 rebounds in 13.6 minutes of play two seasons ago. Strong averaged 3.8 points and 2.9 rebounds at VCU two seasons ago. The two bring experience against talented opponents, combining to start 59 of 63 games two seasons ago. In total, five of the seven rotation members return, plus the three transfers. And then, there are the freshmen. Don’t count them in, but don’t count them out yet, either. Following a 69-31 win over Trine in an exhibition game on Nov. 1, the team opens 2018-2019 regular season play in Hinkle Fieldhouse against Eastern Illinois on Nov. 9.